Especially relevant in these times are the questions that Frailty brings up about the concept of faith. The characters are of no identified demonination which pretty much is the point. While the narrative can be viewed as being about one particularly blessed, or perhaps cursed, family, the themes of Frailty can also be stretched more broadly into that of the so-called culture wars in the U.S., and the wars in the Middle East. The central narrative, about a man a sees visions that he claims are from God, seems common enough. The man receives messages that he is to kill certain people that God has identified as demons. The man's two young sons are enlisted in the cause, one son believing his father's story, the other son remaining skeptical and fearful about his father becoming a murderer. 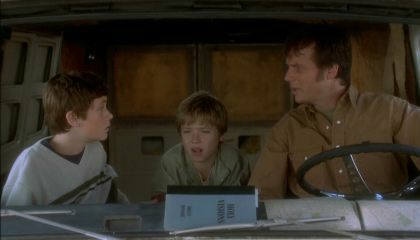 The family is seen in the still above, the book on the dashboard is titled "Holy Visions". Frailty can also be viewed as a revision of Night of the Hunter, had the two children been a bit older and Robert Mitchum layed down his bible and took up an ax (not the guitar kind). Without giving away the plot twists, Frailty is intelligent enough to ask not only if an unimaginable expression of faith was sincere, but also very real. These questions are raised through Bill Paxton's character, known only by the name his sons give him - Dad. One of the few critics who really looked beyond the horror movie trappings of Frailty is Stephen Holden of the New York Times: "(Frailty) is a meditation on faith of several different kinds. Religious faith and a belief in the miraculous is one. Faith in oneself and one's convictions is another. But by far the most important and troubling faith the movie explores is the instinctive faith children place in their parents." It is quite possible that I am also reading more into Frailty than writer Brent Hanley or director/star Bill Paxton ever intended, but the film has a special meaning at a time when so many killings are done in the name of God.